• When are you open? • How can I book an appointment? You can book appointments two ways. front counter person. Set up a time and date with the artist. take your info on your tattoo. They will instruct you to email all reference material. go toward the final price. • How old do you have to be to get tattooed? also need a birth certificate with exact matching full names. • How old do you have to be to get pierced? to receive certain piercings depending on their age. Call our studio for details. They will be required to bring their parent along with: Photo I.D. from both child and parent. And they will also need a birth certificate with exact matching full names. • What forms of payment do you accept. cards will have a 4% service charge added to the final price. • Does your studio sell aftercare products? 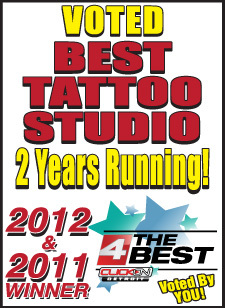 Yes we sell all top of the line aftercare products for tattooing and piercing. • Does your studio sell merchandise? studios or visit the merchandise page on this website. • How do I take care of my new tattoo? be provided with a written aftercare card for you to refer to. • How do I take care of my new piercing?